Pompano Beach based nonprofit The Fruitful Field and former Pompano Beach based nonprofit Taylor’s Closet are two of seven Broward County nonprofits that will receive large grants from the Community Foundation of Broward. Pompano Beach based nonprofit The Fruitful Field and former Pompano Beach based nonprofit Taylor’s Closet are two of seven Broward County nonprofits that will receive large grants from the Community Foundation of Broward. The Foundation created $293,080 in Youth Work grants to help 226 Broward youth build workforce skills that will lead to future career successes. The vision behind the grants was to help young people avoid getting stuck in lower wage jobs that might require them to seek public assistance. Higher youth employment rates are also tied to lower rates of incarceration and drug use. The awarded nonprofits inlcude the Boys and Girls Clubs of Broward County, the Covenant House Florida, FLITE Center, the Fruitful Field, Junior Achievement of South Florida and Taylor’s Closet. 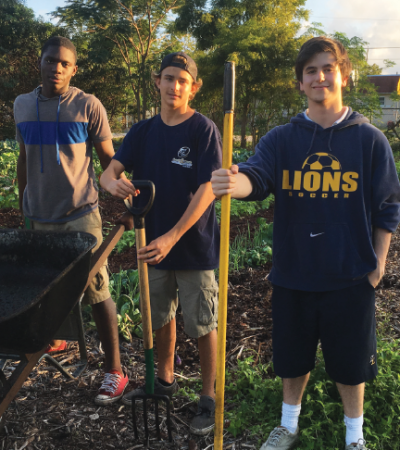 The Fruitful Field, which is an urban farm and garden located behind the Parkway United Methodist Church at 100 NE 44th St., was awarded with a $35,080 grant for its “Grow City Youth Farm and Table Internship,” which will create opportunities for 14 young people. The Grow City program provides real-life, paid work opportunities for youth between the ages of 14 and 17, primarily from impoverished neighborhoods. Participants will learn basic theories of organic agriculture and the science of soil, seeds, growing and harvesting, in addition to training for future employment. Taylor’s Closet Foundation, which was founded and located in Pompano Beach for ten years until it relocated to Fort Lauderdale, will receive a $20,000 grant to bring 12 young girls on board for 40-hour paid internships. Taylor’s Closet runs a mentoring program for teenage girls and works with fashion designers to give away new clothing to girls who need a boost in self-esteem. For more information on the Broward Community Foundation, visit cfbroward.org.